These Events are called K-1 USA because they take place in the USA. 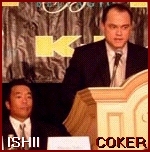 All the K-1 North American Tournaments are Promoted by Scott Coker of San Jose, CA, USA (Left). The K-1 USA event is financed by K-1 Japan.